With financial constraints evaluating the cost and benefits of options facing you requires to be addressed. In 2016 I have set up a mock calf scour problem from which costs can be identified. Do not forget to add in the intangible benefits of the ease and convenience of earlier recovery. When calves are sick (scouring from cryptosporidiosis) and recovering slowly we want to take the best care of them. • To spend more on an electrolyte in the understanding that the more complex the product there is more assistance to the calf. • To use the high energy versions of electrolytes so that they make up for some of the energy losses associated with loss of appetite and the resulting failure to thrive on the absence of milk diets. In the short term, a calf which recovers its appetite earlier is a much easier calf to manage. In this calculation below there is time saving going back onto a (full) milk diet earlier. This also saves body weight loss. No allowance is made for the extra labour for time spent managing the extra size of the hospital mob. This mob will be smaller when KRYPTADE is used to treat calves. Nor is allowance made for the intangible benefit for calf rearers from seeing the calves responding more quickly. Animal welfare aspects of calves feeling better earlier also occur. For outbreak with no EXAGEN, using KRYPTADE for the electrolyte. The cost to replace same aged heifer is $150. 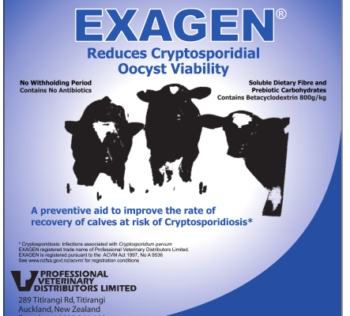 60 calves requiring Exagen 25 g per day. This comparison excludes cost of labour for treatment plan with electrolytes (KRYPTADE or alternative). Some electrolytes will give a higher or lower cost for electrolyte treatment depending on individual brand. 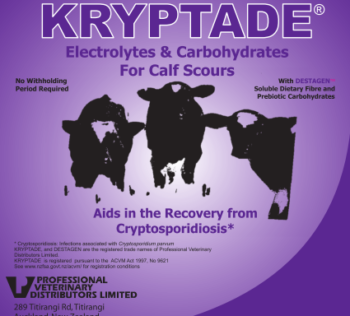 Even KRYPTADE incurs an additional labour expenditure as the only product giving a treatment advantage. 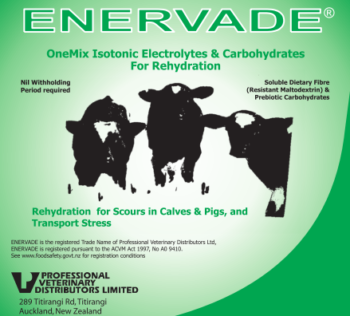 Note an average of 1 electrolyte treatment isotonic solution – ENERVADE – may be required to ensure mildly scouring calves remain hydrated (using an lib electrolyte solution feeding strategy at night).